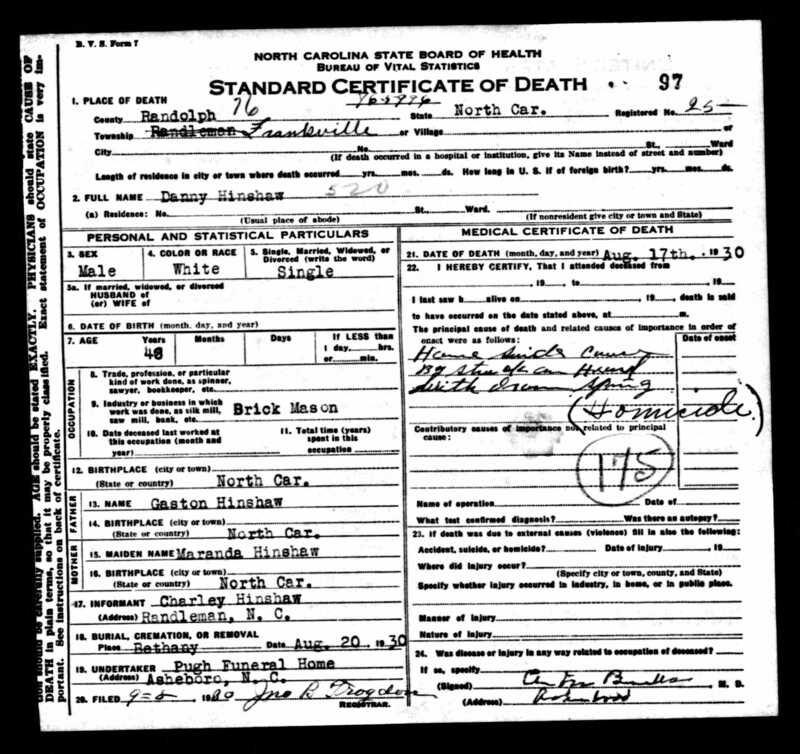 Born Oct - 18811,2,3 [Oct 1 18804, Oct 1 18825], North Carolina1,2,3. 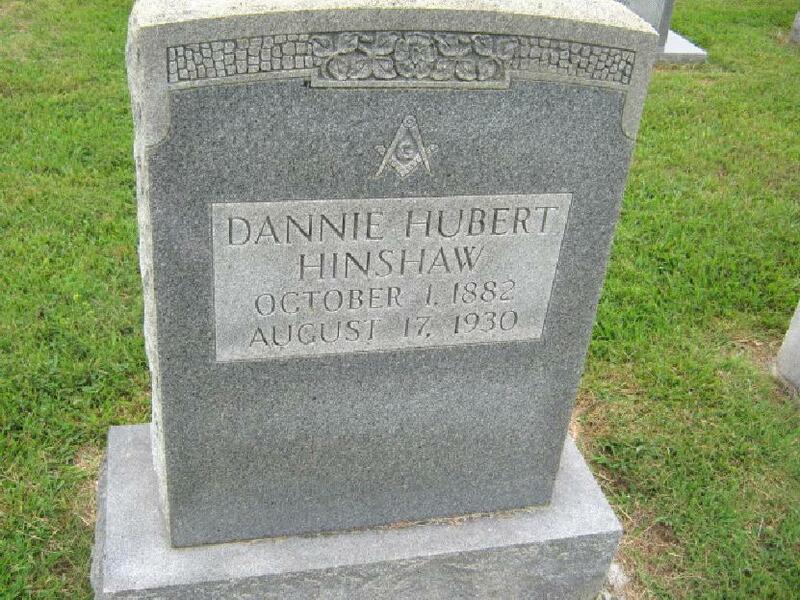 On Sep 12 1918 Daniel Hubert Hinshaw, age 37, registered for the World War I draft at Asheboro, Randolph County, North Carolina. He declared his residence as Randleman, Randolph County, North Carolina, a self-employed farmer. He declared his nearest relative was Gaston G. Hinshaw of Randleman. He was recorded as medium height, medium build, brown eyes, brown hair.4 (Daniel and brother Edgar registered the same day, with essentially identical information declared). Hinshaw, Dannie, head-of-household, age 39, born in North Carolina; parents born in North Carolina; single; owned home; no radio in home; occupation: mason, brick; not a veteran. Danny was killed when struck by his nephew Jesse, who was charged with his murder9,10 (see newspaper articles below). It is unknown if Jesse was ever convicted. 1930 census, Franklinville Precinct, Randolph County, North Carolina; roll T626-1715, ED 15, page 14B, line #76, dwelling #310, family #357. 1930 census, Franklinville Precinct, Randolph County, North Carolina; roll T626-1715, ED 15, page 14B, line #77, dwelling #311, family #358. 1930 census, Franklinville Precinct, Randolph County, North Carolina; roll T626-1715, ED 15, page 14B, line #75, dwelling #309, family #356. "The Landmark" (Statesville, North Carolina), Aug 18 1930; http://www.ancestry.com. "Burlington Daily Times" (Burlington, North Carolina), Aug 19 1930; http://www.ancestry.com.